Xiaomi was recently in the news for stealing away Android’s VP of Product Management, Hugo Barra. Hugo Barra’s new role with Xiaomi, as VP of Xiaomi Global, will be to help guide its growth strategy in markets outside China. 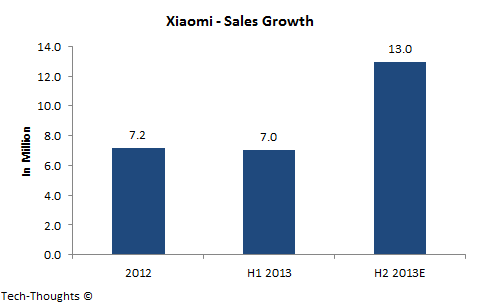 Let’s take a look at the key drivers of Xiaomi’s international growth prospects. For those readers who may be unfamiliar with Xiaomi, let me provide a brief overview of the company. The 3-year old Chinese OEM, founded by Lei Jun and Bin Lin, has quickly shot up the smartphone sales charts to overtake Apple in the country. In fact, Xiaomi’s Mi 2S was said to be the most popular smartphone in China, overtaking the Galaxy S4. In addition to this, initial stocks of Xiaomi’s $130 “Red Rice” smartphone sold out in less than 90 seconds and then racked up more than 7 million preorders. Since Xiaomi’s business model is focused on services, it allows the company to price its products slightly higher than the BOM cost. As a result, Xiaomi’s products are priced at roughly $100-$330, far lower than competing smartphones of the same quality. Xiaomi also uses a customized Android skin with crowd-sourced updates, called MIUI, which is fairly popular among the developer community. In China, a majority of Xiaomi’s smartphone sales have come from the prepaid market. This allowed Xiaomi to use an innovative manufacturing and distribution model – Xiaomi sells 70% of its devices online, which it manufactures in batches, and usually sell-out in a matter of minutes. It has now begun to expand overseas, first to Hong Kong and Taiwan, which are primarily carrier subsidized markets. The results so far have been impressive – Xiaomi’s flagship is already the third best-selling phone on one of Taiwan’s largest carriers, after the HTC one and the Samsung Galaxy S4. As a result of this performance, the company recently raised funds at a valuation of $10 billion, which is more than twice HTC’s current market value. In short, the company’s rapid ascent has been impressive and the investing community has great confidence in their growth prospects. Xiaomi's customers are twice as active on the mobile web as those of other manufacturers. 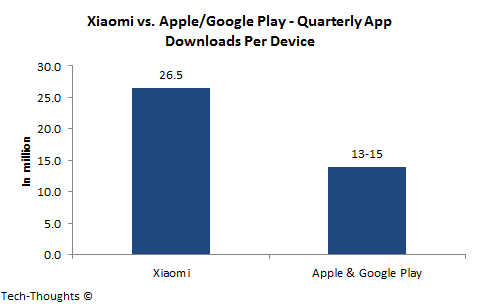 Xiaomi’s app download rate is almost twice of that on iOS and Google Play, which seems to be consistent with Bin Lin's statement. This is even more staggering when we take into account the fact that Xiaomi’s application base is likely to be far smaller than the 900,000 apps available on iOS and Google Play. International variants are likely to have access to Google Play’s application base, which could boost downloads. However, since the overall user base is still small, usage metrics are likely to go down as their products begin to reach a larger base of mainstream users. As I stated in my last post on carrier motivations in subsidized markets, a carrier’s primary goal is to sell smartphones that maximize ARPU and minimize churn rate while also minimizing subsidy costs. While this was a challenge in the early years of the smartphone industry, the data consumption rates across flagship devices have rapidly narrowed. In other words, flagship smartphones are rapidly becoming “good enough” for carriers who happen to be direct customers of smartphone OEMs. Xiaomi’s doesn't necessarily have to beat high-end flagships in terms of data usage, but needs to reach comparable metrics. In other words, Xiaomi’s challenge boils down to being “good enough” for carriers. If they can establish this trend in subsidized markets like Taiwan & Hong Kong, it is in carriers’ interest to invest in marketing & branding their products. In addition to the data consumption rates, carrier subsidies on Xiaomi’s devices will be a fraction of what is paid to companies like Apple & Samsung. Even in a financed smartphone distribution model (like T-Mobile’s), the low acquisition cost and high quality is likely to appeal to consumers, if the carrier puts sufficient marketing muscle behind it. Carrier marketing funds are currently allocated to leading flagships because of contractual obligations and a lack of appealing options. This is likely to change going forward as bargaining power shifts back to the carriers, which would be favorable for companies like Xiaomi. Xiaomi’s next target market is rumored to be Europe. We may soon find out just how effective this strategy will be.